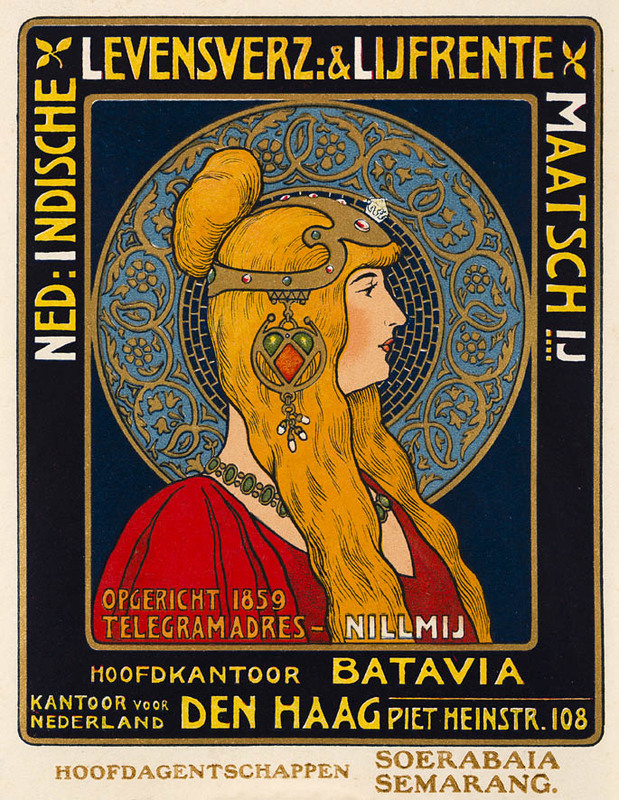 This beautiful Art Nouveau advertisement was made for the Nederlandsch-Indische Levensverzekering- en Lijfrente-Maatschappij (NILLMIJ). 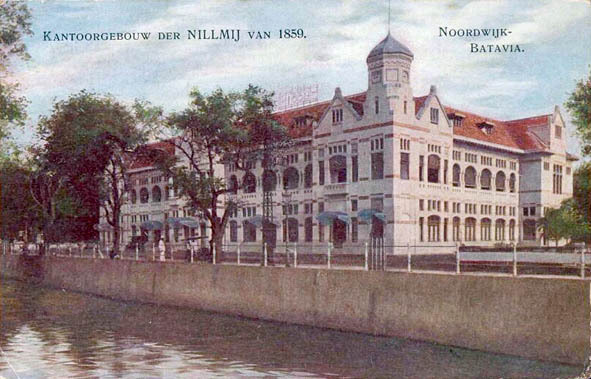 The NILLMIJ was an insurance company in the Dutch East Indies. The company was founded in 1859 by a Dutch colonist and was known for its modern Art Nouveau buildings. The NILLMIJ had offices in Batavia (now Jakarta), Surabaya, Semarang, Bandung and Medan. The branch offices in The Netherlands were located in Amsterdam, Rotterdam and The Hague. The design of the advertisement dates from around 1900. The ‘en profil’ pose and the circular medallion in the background are typical for the early Art Nouveau. The depicted woman with her beautiful tiara and precious jewels shows some resemblance with the work of Alphonse Mucha and Henri Privat-Livemont. Only their work is more sophisticated. It’s not clear who the woman with the jewelry is. Maybe she’s a Greek or Roman goddess or just a fantasy woman? Her head ornament is decorated with inlaid gemstones and a big diamond. The green gems in her necklace and tiara refer to the nickname of the Indonesian archipelago which was called in the Netherlands: ‘de gordel van smaragd’ (the emerald belt).